University Park, Pa. — The dramatic deindustrialization of much of Pennsylvania during the 1980s and 1990s left many areas of the state in serious need of revitalization. Once vibrant and bustling communities have been left in disarray. Deteriorating streets, abandoned factories and buildings and empty storefronts are found in cities like New Kensington, Pa., a town located 18 miles northeast of Pittsburgh. Esther Obonyo, associate professor of engineering design and architectural engineering, was awarded a $25,000 grant from Penn State’s Institutes of Energy and the Environment to design and test a new roofing composite. The project is part of an ongoing economic development initiative in the city of New Kensington. The initiative was stimulated by an Invent Penn State seed grant that funded the creation of Penn State New Kensington’s Corner LaunchBox entrepreneurial center and coworking space, a cornerstone for the city’s revitalization and development efforts. Through Corner Launchbox, Penn State New Kensington campus chancellor Kevin Snider is working to entice new businesses to the community by highlighting New Kensington’s affordable real estate market. A goal of the program is to find cost-effective ways to improve and retrofit building elements in disrepair to help encourage business growth in the area. 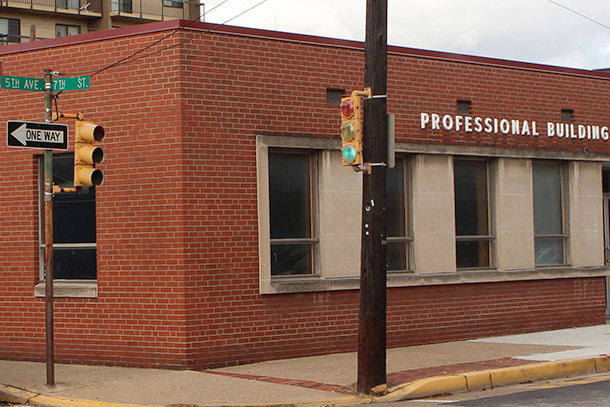 To gather data on the building elements, representatives from Penn State New Kensington have been working with city officials to engage community members in the improvement conversation. A panel consisting of Obonyo; Snider; Clive Randall, director of the Materials Research Institute (MRI) and professor of materials science and engineering at Penn State; and Steve Leonard, an industry-based innovation manager, also spent time discussing the problem and possible solutions during MRI’s 2017 Materials Research Day in October. The collected data and information points to leaky roof problems as a top priority to improve local buildings in the New Kensington area. With the help of co-investigators Randall, Snider, and Ali Memari, Bernard and Henrietta Hankin Chair in Residential Building Construction, director of the Pennsylvania Housing Research Center and professor of architectural engineering and civil engineering, Obonyo hopes to fix this issue. According to the Center for Environmental Innovation in Roofing, each year nearly 4 billion square feet of roof coverings are installed in the United State alone. Re-roofing work to existing buildings accounts for close to 3 billion square feet. Because building materials can equate to one-third of the total cost of construction, Obonyo and her team are working on a concept that uses innovative materials, reduces costs, lowers energy costs and optimizes the use of resources. The team’s initial conceptual model, a rubber-type membrane like ethylene propylene diene terpolymer (EPDM) will be installed on top of the old, leaky rooftops. Aluminum panels will play a role akin to ballast to prevent movement. To produce energy, a thin-film photovoltaic solar cell layer will be attached to the panels. “We believe that our proposed multifunctional solution is more cost-effective because it addresses the existing moisture-related durability concerns, while also improving the energy efficiency and environmental sustainability of the building envelopes,” Obonyo said. Both simulations and lab testing will be used to determine the model’s practicality in regards to waterproofing, insulation and condensation minimization. The research team will use the gathered data to refine the initial prototype to deliver a detailed, sustainable and energy-producing reroofing system. Obonyo also looks to investigate additional challenges New Kensington is currently facing in the future. Crumbling foundations; issues with sewage, water and power; spaces for the aging; and workforce demographics and meaningful educational experiences in the K-12 school system rise to the top of her project list. “Transformational use of sustainable building materials would result in significant financial benefits, reducing construction costs while enhancing the use of scarce materials [in the area],” Obonyo said.